1. The 1914 catalogue of Goodmans of Bairnsdale. 2. The catalogue of Railton and Co, about 1880. 3. The list of fruit trees grown at "Friedenstruh Orchard"
5. [Nobelius31] Catalogue of C. A. Nobelius & Sons, Gembrook, 1931. Cherries were 2/6 each grafted on mazzard seedling stocks. 6. [Grays] The 1907 catalogue of W G Gray, Nurseryman, Diamond Ck, Victoria. 7 [Frankston] Formerly grown at Frankston by the Dept of Agriculture. DALMORE WHITEHEART (EGOAA) A seedling that came up on the Dalmore property at Dargo. The flesh near the seed is white in colour. Heavy bearer of good flavoured cherries. Brought to our attention by Vince Phelan of Dargo in 1992. (EGOAA). BIGARREAU DE' HOLLANDE Large bright red fruit, with very firm flesh. 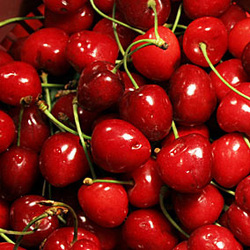 Cherries can be budded or grafted onto cherry rootstocks. It is likely that the modern rootstocks available may be the best suited. Rootcuttings can be raised from these. Take a section of root over 5mm thick,60-100mm long, and plant it vertically with the top section just out of the ground.